Load some fresh Play-Doh compound into the gravel grinder and crank the handle to crush it into rocks! Big-time jobs call for heavy-duty imaginations! The 2 toy construction trucks and a cool cranking grinder are all ready to grind and dump stone, haul heavy loads, roll out smooth roads, and pave the road to building fun for ages 3 and up! With a 2-ounce can of Play-Doh Buildin' compound that looks just like pavement and 3 more non-toxic Play-Doh colours in 2-ounce cans, kids have just the construction materials they need for their next big haul. The mighty gravel grinder tool can mould and pummel pretend rocks into groovy gravel, then the dump truck toy and steam roller for kids can haul and smoosh the rocks away. 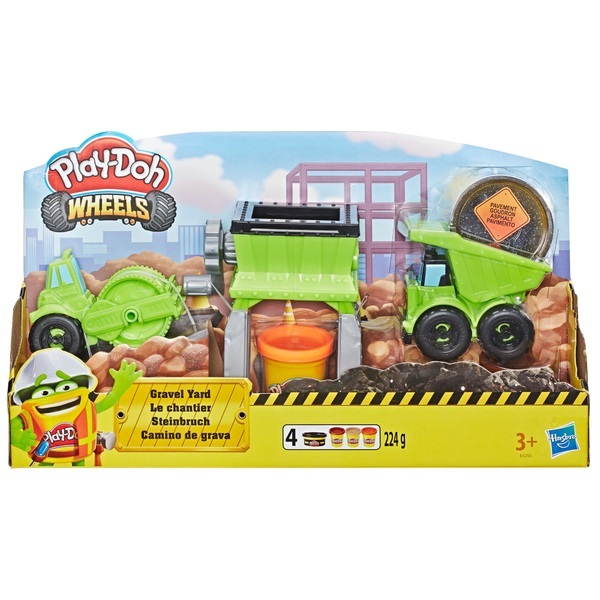 This is the perfect gift for preschoolers who love trucks and want loads of Play-Doh fun! EU Warning: Not suitable for children under the age of 3 years due to small parts which could cause a choking hazard. Do not eat.